In this all-new very special mini-series, the Aldens have been recruited by a secret society to return lost artifacts and treasures to their rightful locations—all around the world! After finding a painted turtle figurine, the Aldens are introduced to the Silverton family and Reddimus Society, a secret guild whose mission is to return lost artifacts and treasures to the sites they were taken from. The Aldens board a private train to New Mexico to return the turtle to its original home, and they encounter enemies of Reddimus along the way! The trip is a success… but instead of returning home, there’s a last-minute change in plans. 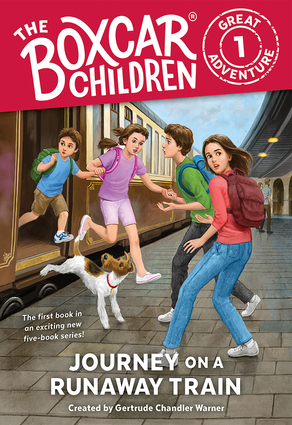 The Boxcar Children must continue the mission for the society and deliver more things, all around the globe! Gertrude Chandler Warner was born in 1890 in Putnam, Connecticut, where she taught school and wrote The Boxcar Children because she had often imagined how delightful it would be to live in a caboose or freight car. Encouraged by the book's success, she went on to write eighteen more stories about the Alden children.